St. Martin was a Roman soldier in the 4th Century AD who, amongst other achievements, shared his cloak with a beggar. Apparently it was during a snowstorm and the beggar was freezing to death, so Martin cut his cloak in two and gave half to the beggar. That night, either due to the effects of the cold or Jesus, he had a dream where Jesus was wearing the beggar’s half of the cloak and telling everyone that he had been clothed by Martin. He is also known for being baptised at a time when Christianity was not popular in the Roman army and offering to lead troops into battle unarmed so that he wouldn’t have to kill anyone, as well as being the Patron Saint of soldiers. Oh yes, and when a grateful church wanted to make him a Bishop, he ran off and hid in a goose shed until the honking of the geese gave him away and he was dragged kicking and screaming into his Bishopric. So, an all-round good egg, it seems. As always, Wikipedia has a wealth of extra information if you are interested. St. Martin’s Day New Wines. St. Martin Arrives On A White Horse. Now we get to the important part… St. Martin’s Day is on November 11th and traditionally at 11.11 in the morning, the new wines of the year are presented for tasting and the feasting, merrymaking and general wine-related shenanigans begin. I don’t know if there’s a connection between St. Martin the Patron Saint of soldiers and the date and time chosen to end the First World War but I’m looking into it, so watch this space. As the season for Burcak ends, the season for new wines begins. In a tradition shared among many European countries, there is much feasting and merry-making. Like most of the celebrations around the Czech calendar, it is tied closely to the land and the seasons. As the days get shorter, the agricultural lands are put to bed for the winter and some of the animals who have been enjoying a better than average diet for the last few months suddenly find out that there’s no such thing as a free lunch. 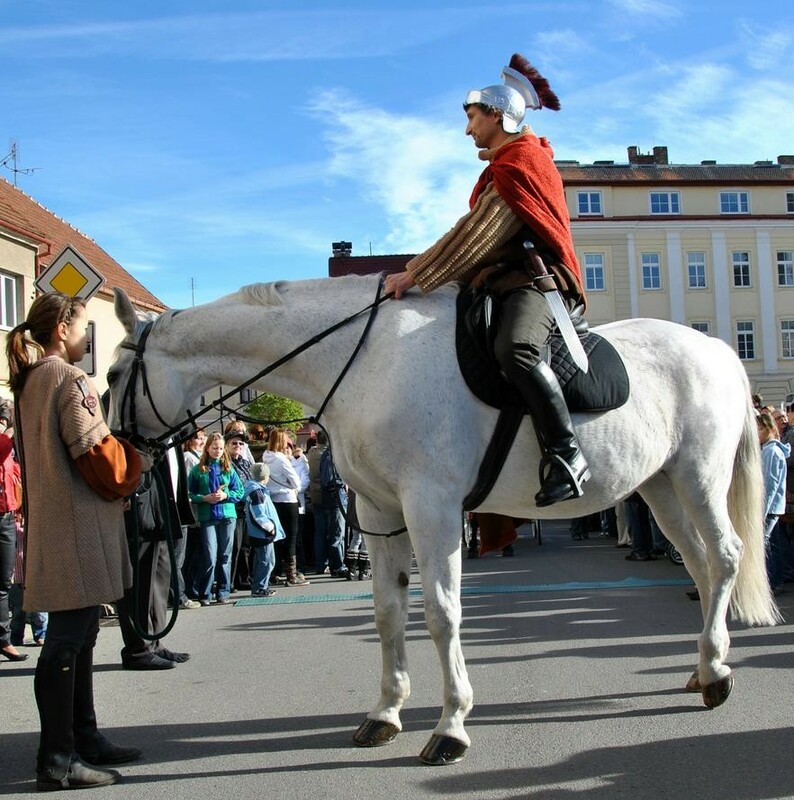 The ceremonies usually start with an appearance by St. Martin on a white horse. Obviously it’s not the real St. Martin because he died in 397 AD but like Father Christmas in your local shopping center, it’s a bloke dressed up. There’s a Czech expression that says something like ‘Martin arrives on a white horse’ (Martin přijíždí na bílém koni), which is a reference to the fact that the first snows of the year often arrive around the middle of November. St. Martin’s Day Roast Goose Feast. St. Martin’s Day Roast Goose, Potato Dumplings & Red Sauerkraut. For many, St. Martin’s Day is synonymous with roast goose. For many others (often with generous waistlines), it’s another excuse to eat a huge amount of fat. Goose is a good choice to go with tasting new wine because if you eat small portions regularly throughout the day, you can enjoy a surprising amount of wine. The wines shouldn’t contain preservatives either, so even if you do over-indulge, the hangover is far better than you have any right to expect. 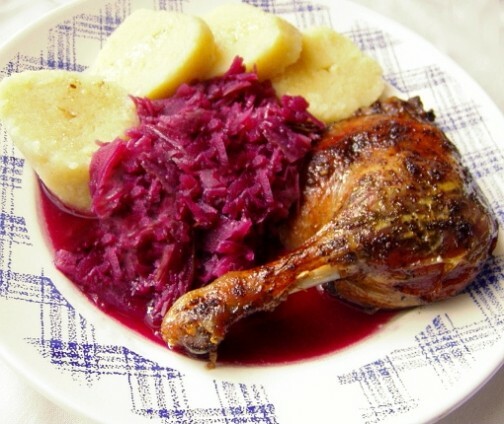 The goose is served crispy and golden with potato dumplings and red sauerkraut. Sauerkraut is a wonderful source of Vitamin C during the winter months and as for potato dumplings… well, come and experience a Central European Winter and you’ll appreciate a belly full of potato dumplings in a warm restaurant! Of course, depending on the flavour of your religion, the Feast Of Saint Martin might have marked the beginning of 40 days of fasting leading up to December 21st, or Mid-Winter’s Day. Therefore it was the last chance you were going to get to stuff yourself full of energy before suffering the full fury of winter on an empty stomach. 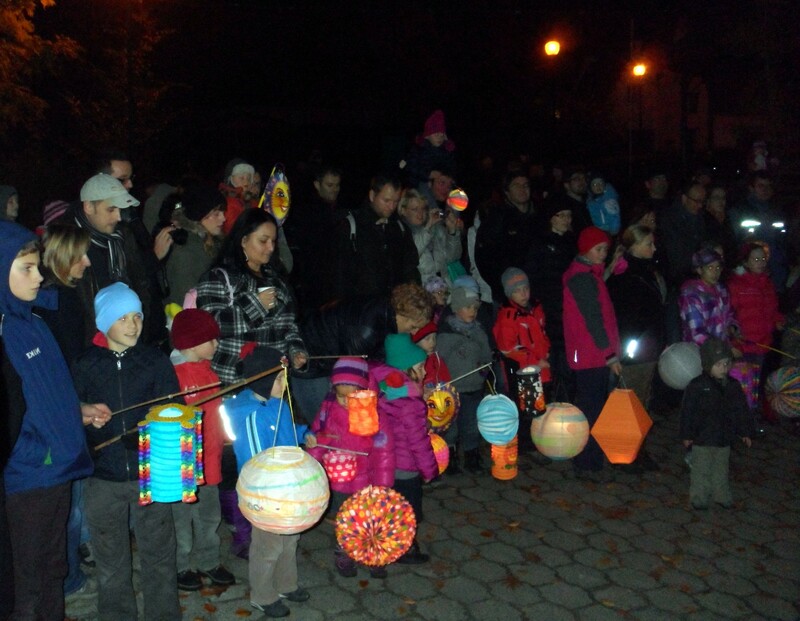 St. Martin’s Day Lantern Parade. If you are too young to drink wine on St. Martin’s Day (definitions of ‘too young’ may vary wildly according to precise location), you may enjoy taking part in a lantern parade. Schoolchildren usually make their own paper lanterns, which are hung on a stick with a candle inside. The children, accompanied by parents and grandparents, parade through the village, or around their school if they live in a town, singing songs about St. Martin. According to my Czech friends, this practice is associated with Communism, which strikes me as a bit odd as Communists are not known for their religious beliefs. Everyone I’ve asked tells me that it was an occasion for good Communist children to gather and be good Communist children but this tradition goes back much further than Marx and Lenin. I am assured unanimously that the tradition was scrapped after the Velvet Revolution but over the last 10 years or so has begun to reappear. In the next few days I hope to meet a few people who remember Czechoslovakia before 1968 and ask them if they had St. Martin’s day lantern parades. As for myself, Our Lass and Our Kid, we will be enjoying roast goose after a nice long walk in the countryside, a few glasses of new wine and we’ll watch the lantern parade because Our Kid isn’t old enough to go to school yet. Our Dog will be waiting anxiously for the leftover goose!